Today, the Lunar New Year is widely celebrated in Australia each year. Lion dances and Asian cultural performances on city streets are a common sight here in the weeks leading up to start of the brand new lunar calendar. Various profit/not-for-profit bodies and everyday people from all walks of life frequently and tirelessly pitch in to organise and partake in these festivities. However, interestingly enough, the Lunar New Year, also known as the Spring Festival, holds contrasting meanings for different groups Down Under. The Lunar New Year is marked by extended public holidays in several parts of Asia. Many living here often take advantage of their mandatory time off from work, choosing to travel abroad. Australia is becoming a very popular destination with them given the country’s relatively friendly geographically distance. The country’s viability as a tourist destination is constantly seen as an opportunity by the Australian government and the local tourism industry as a means to generate state revenue. This year, hotels and luxury retail sectors here have been “pulling out all the stops” – for example putting up Chinese New Year decorations in hotel lobbies and offering Chinese food – to accommodate roughly 80,000 visitors from China and Hong Kong to Australia at the beginning of the year, cashing in on an ever increasing influx of Lunar New Year tourists. Although such generous hospitality seeks to recreate the authentic New Year atmosphere that these tourists are accustomed to in their homelands in Australia, ultimately this sector’s main aim is to reap financial profits. In addition, Chinese tourists are spending more money than ever during the festive season here and Tourism Australia has urged Australian retailers to be more aware of this target market for their financial gains. As such, Asian tourists are encouraged to spend during the Lunar New Year in Australia, spurred by profit-making local government sectors. They are enticed to exhibit frivolous material behaviour during this time of the year – a prime time of the year for respecting and reflecting on traditions – for the benefit of the local economy. Moreover, established local companies often incorporate a “New Year” theme within promotional offers in order to attract the attention of Asian clients to utilise their services and products, exacerbating the commodification of this season. For instance, the Big 4 Australian banks frequently pay homage to the season to their “valued Asian customers” in an attempt to make the festival “a lot of fun” in their branches. Auspicious Lunar New Year elements that tend to be close to hearts of many Asians are often prominently integrated within their banking advertisements and deals at this time of the year. Ultimately, such strategic Lunar New Year marketing not only aims to attract Asians as clients but also functions as means for these companies to purport a much esteemed multicultural image in the eyes of every member of the public – potential clients. 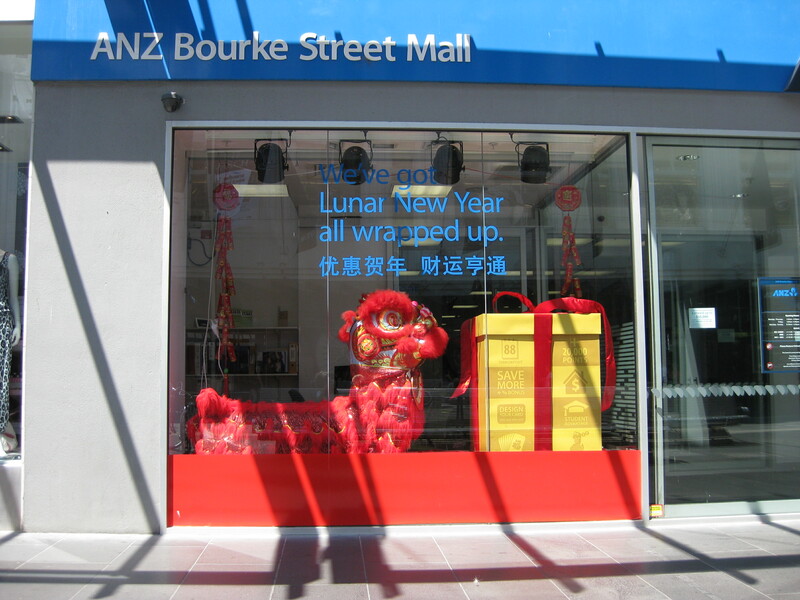 Australia’s ANZ Bank decorating its branches with Chinese dragons. This can actually be seen, and most likely is, a marketing ploy to attract more customers during this festive season. Photo: Mabel Kwong. Unlike many countries in Asia, the Spring Festival is not heralded by public holidays in Australia. Rushing around and trooping from house to house collecting ang pows, boisterously catching-up with extended relatives and having too much to drink during this period seems somewhat toned down here for those who celebrate the Spring Festival, most likely due to the fact that many of their family members reside in their homelands. Instead, it is common for them to mark the start of the Lunar New Year with a simple yum cha lunch or a trip down to the CBD’s Chinatown to watch the Lion Dances. For David Kong, a descendent of Chinese philosopher Confucius who lives in Alice Springs, Chinese New Year celebrations in Australia are modest in scale. David is fond of painstakingly cooking authentic hand-made dumplings and sharing them with Chinese friends when this festival rolls around. Similarly, this year Kelly Cao and Eric Fan’s children headed down to the Riverland in Adelaide to learn more about their Chinese heritage. Such relatively quiet activities may sound dull and lack the energetic liveliness of the celebrations held in parts of Asia. However, these small scale Lunar New Year celebrations in Australia are essentially about memory, namely the scrupulous recreation of homeland cultures. More importantly, for those celebrating the Lunar New Year in Australia, these low-key festivities provide them with the opportunity to considerably acquaint and meticulously preserve their ethnic values and traditions, sans over-indulging on festive nibbles (or perhaps just a little bit), listening to family gossip and forgetting the true meaning of the Spring Festival. Enjoyment can definitely derived from the cosy Lunar New Year celebrations in Australia. What’s not to like about trying your very best to cook a New Year dish or organise a Chinatown trip on the first day of the New Year and everything goes well? Although there are capitalist ideals beneath government and corporate private organisations’ Lunar New Year celebratory initiatives, there is no denying that they do aim to encourage both tourists and locals to have a joyous time or at the very least get into the harmonious spirit of a brand new lunar year. It is fair to say that the Lunar New Year is not only celebrated but actually recognised and accepted in Australia as a yearly event today. Picturesque Lunar New Year festivities Down Under often depict Australians of various backgrounds and races celebrating the festival together and cheerfully partaking in or admiring Asian cultures and performances, united as one. Happy multicultural moments. And sometimes, perhaps most of the time, this is simply just that. 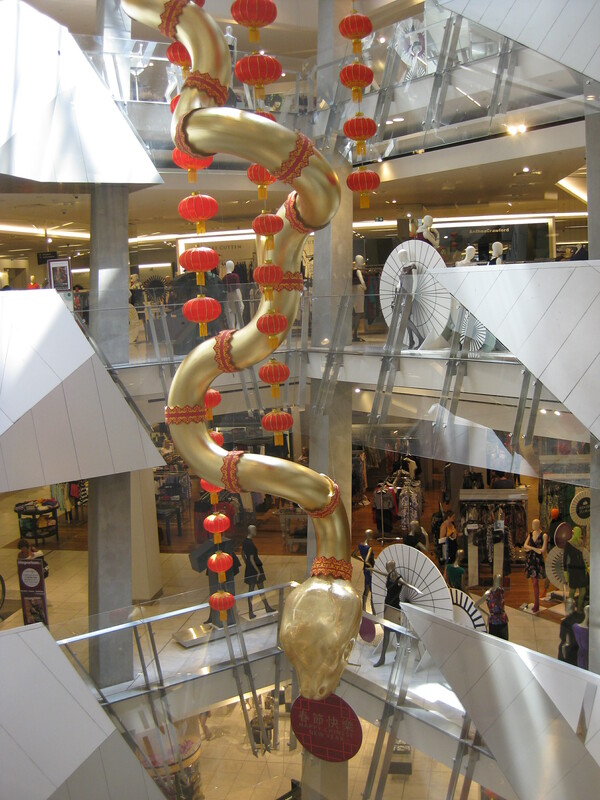 This entry was posted in Asian, Australia, Lifestyle, Multiculturalism and tagged Asian, chinese new year, commercialisation, community, festivals, lunar new year, marketing, multiculturalism, opinion, snake by Mabel Kwong. Bookmark the permalink.